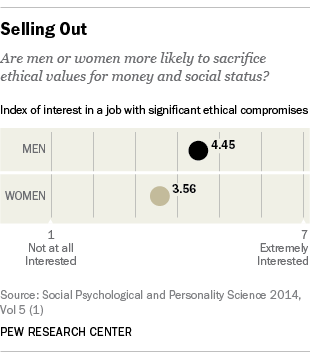 Here’s another possible explanation why there are so few cracks in the corporate glass ceiling: Men seem far more willing than women to sacrifice their ethical values in exchange for money or success on the job. Or at least that’s the claim of two researchers who conducted a series of experiments that found women were less inclined than men to sell out their values in order to win bonuses and promotions, keep down workplace rivals, curry favor with superiors or otherwise advance their own careers. “We propose that women, more than men, find ethical compromises unacceptable,” wrote researchers Jessica A. Kennedy of the University of Pennsylvania and Laura J. Kray of the University of California, Berkeley, in the latest issue of the journal Social Psychological and Personality Science. There are other theories as to why only about 4% of senior executives in investment banking are women, as are 4.2% of chief executive officers at Fortune 500 companies (that percentage will tick up on January 15 when Mary Barra takes over as General Motors’ new CEO). Those theories include the lack of advancement opportunities for women, a paucity of female mentors and gender discrimination. A recent Pew Research Center study on women and work highlighted how family pressures hampered working women from advancing as quickly or as far on the job as men. In their first study, Kennedy and Kray recruited 65 women and 38 men online using the Amazon Mechanical Turk website. The participants read 14 vignettes that described compromises of ethical values in order to make more money or enhance status on the job. For example, one vignette “described assigning a talented subordinate to peripheral projects and publicizing the subordinate’s mistakes in order to prevent this person from receiving too much respect and admiration,” they wrote. Then, study participants were asked to rate their reaction to each vignette on a seven-point scale in terms of how objectionable they felt it was, how upsetting it made them feel, how morally acceptable they thought it was and four other factors. The researchers averaged the 14 individual ratings, which ranged from 1 (“not at all”) to 7 (“very much,”) to arrive at a final score. “As hypothesized, women experienced more moral outrage and perceived less business sense than men when confronting ethical compromises made for either monetary or social status gains,” they wrote. But there was a twist: After that brief description, some respondents were told that “the company’s norms favored profits”—a big hint that their success on the job would be measured in terms of dollars and cents and not their adherence to ethical standards. Other respondents were told that the company favored choosing “in favor of ethics.” A third group—the control group—got no clue about the company’s preferences. Participants were asked how interested they were in working for this firm on a scale that ranged from 1 (not interested) to 7 (extremely interested). Again, they found that “women reacted more negatively than men to ethical compromises. When a job entailed ethical compromises, women reported less interest in it than men did, despite exhibiting no difference when the job did not entail ethnical compromises.” In fact, women on average rated their interest almost a full point below men on the seven-point scale (4.45 vs. 3.56 for women). About the authors: Jessica A. Kennedy is a Post-Doctoral Fellow in the Wharton School at the University of Pennsylvania. Laura J. Kray is the Warren E. & Carol Spieker Professor of Leadership at the Haas School of Business at the University of California, Berkeley.